In a Tsukuba Circuit paddock packed with wide-hipped 911s and high-power GT-Rs, it’s funny what ends up catching your attention. Nissan’s S-chassis models are still a fairly common sight on the streets of Japan, but supplies are being slowly depleted by exports to the rest of the world or, more likely, being sent to an early scrap-heap grave by young drifters. 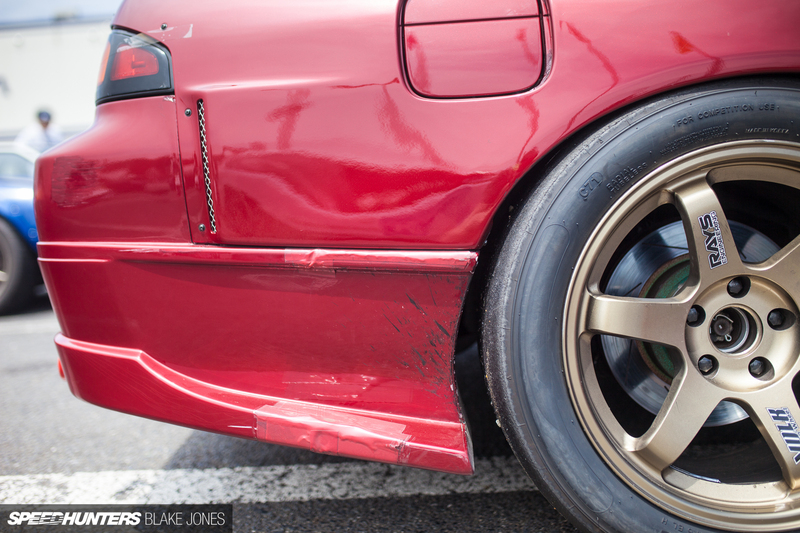 So when a well put together, grip-spec S14 showed up at idlers Games earlier in the month, I had to take a closer look. 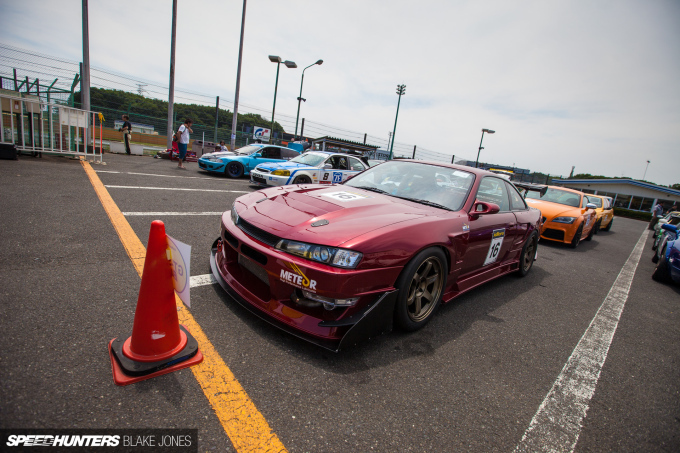 This particular Silvia is an idlers regular; the owner mentioned that the car had made an appearance in Speedhunters’ coverage of the same event way back in 2013 before it was wearing the wide fenders and enlarged front splitter. It was prepared by a small shop trading under ‘Race War’s Sunbest Assist Tuning’, a great example of Japan’s creative usage of the English language. 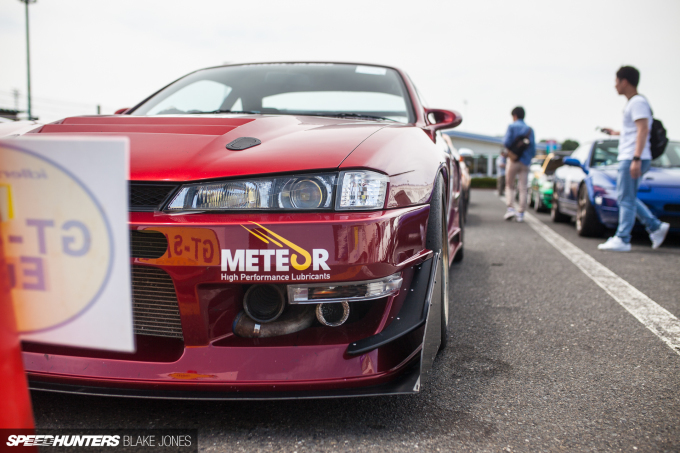 For a race car, the paintwork was mercifully free of an excess of graphics or stickers; these cool-looking Meteor stickers representing the car’s sponsor, a relatively small lubricants brand that makes its products in Japan and primarily promotes them through grassroots events like idlers. There was a time when I’d have thought that the integrated canards and splitter the Silvia’s front end was wearing were extreme, but compared to the sort of creations we’re seeing at events like the World Time Attack Challenge it looks almost understated. The difference a few choice aerodynamic elements can make to lap times shouldn’t be underestimated. There are those who might say the RAYS Volk Racing TE37 is an uninspired choice thanks to its ubiquity, but you really can’t argue with the purposefulness of the look. 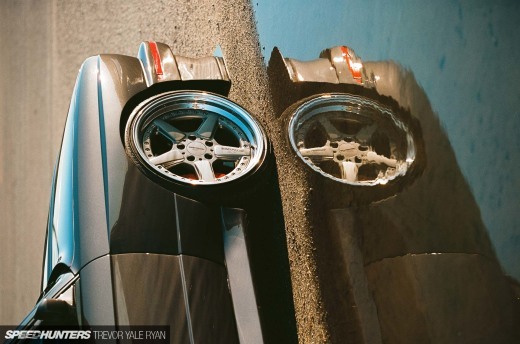 The combination of a 17-inch wheel with a chunky sidewall helps, too. Lest we forget the time when riveted-on overfenders were the preserve of race cars. 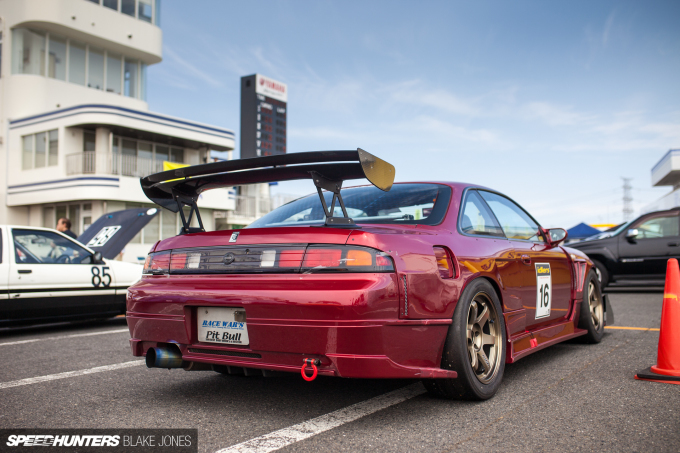 The Glare Zenki GT panels add 100mm of total girth to the rear of the car and make enough space for the 275-section tyres to help get the power down through the two driven wheels. I’d initially mistaken the rubber for a full slick, but the owner pointed out that they are actually Hankook’s Ventus Z214 semi-slick. The two longitudinal grooves certainly push that definition to the limit, however. The car was clean overall, but get close and the characterful battle scars from years of on-track action become visible. Peering into the driver’s side window showed that the interior was pretty typical affair with the stock dash and door trims remaining, but carpets and sound deadening binned. 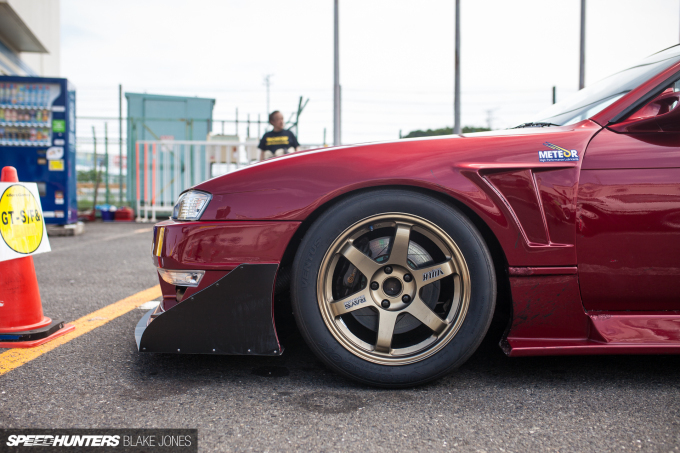 Perhaps most notably, the S14 wasn’t running any sort of roll-cage; I guess when every gram counts, the extra 50-plus kilograms of a simple cage is out of the question. With so many proven ways to extract big power from an SR20DET, there’s really no reason to consider anything else. 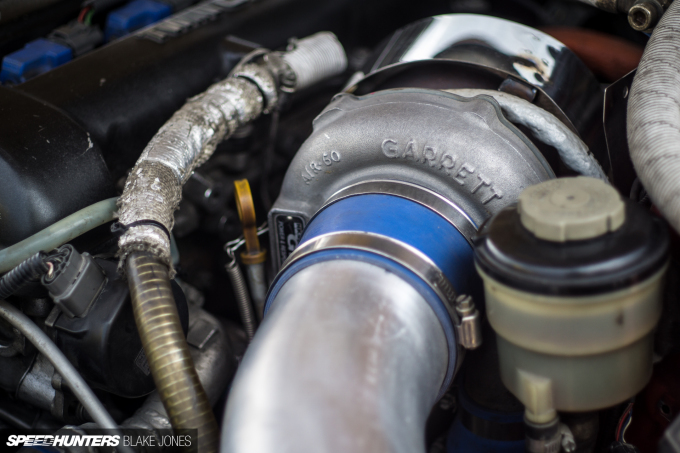 A sizable, high-mount HKS GT-series turbo sends about 450hp to the crank. This is about the limit of reliability of stock SR20DET internals, although I couldn’t determine if the rotating assembly was still factory. All this equated to a fastest lap right sitting right on the one minute barrier – a 1’00.735 to be precise. That pace was enough to keep the more modern AWD competition at bay in the GT-F class 12-lap race at the end of the day. I’m sure with a little more tweaking, this grip-built S14 will be turning out sub-one-minute laps in no time. 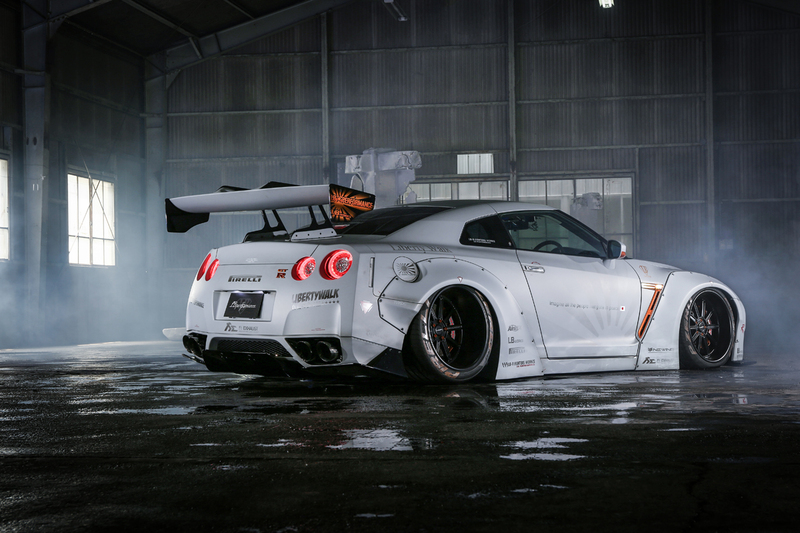 Love the bumper/canards on this! It's pretty surprising that none of these guys are running a cage though. What's the blue brace in the interior picture? Cusco Seat Braces. Have a set myself. Connects to the seat belt mount point on the B pillar, front outside mounting point of the seat and then bolted to the floor in the footwell area. By far not for safety but for stiffness. 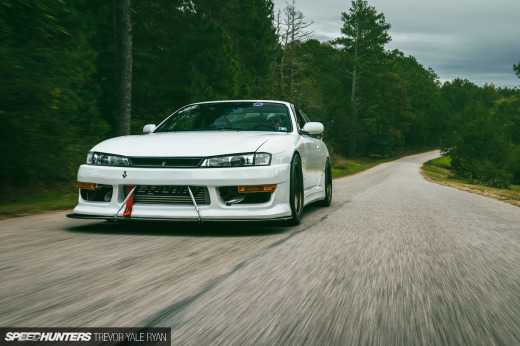 An S14 with an SR20 is weirdly rare! 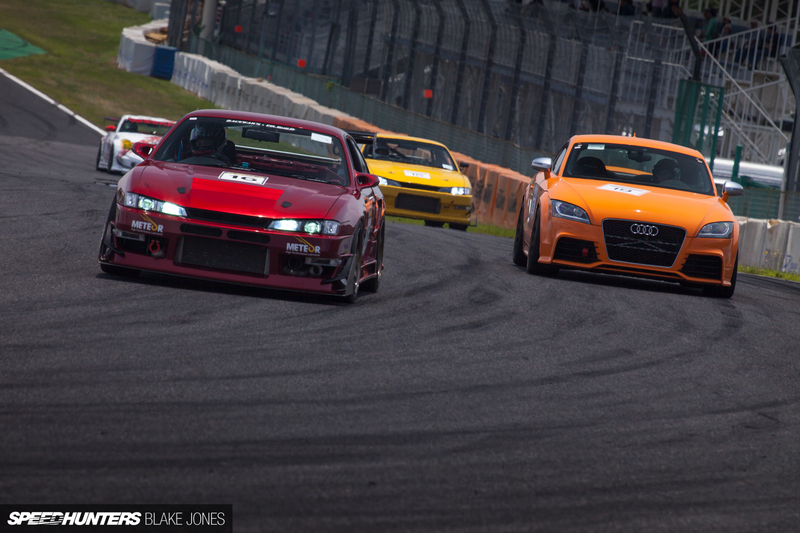 What with all the JZ and V8 lumps. Refreshing. Maybe to nooby types ! My favorite kind of features - reasonably priced cars and grassroots events. Keep it coming! 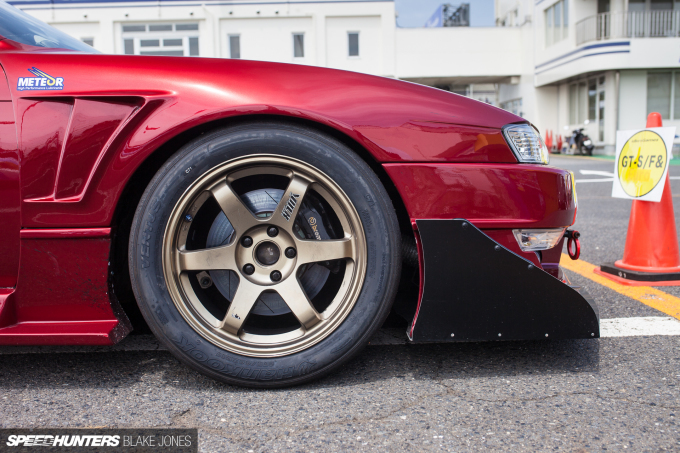 It's very refreshing to see an S14, or any other Nissan S chassis for that matter, built to grip. I also love seeing more of these grassroots cars. Great post. 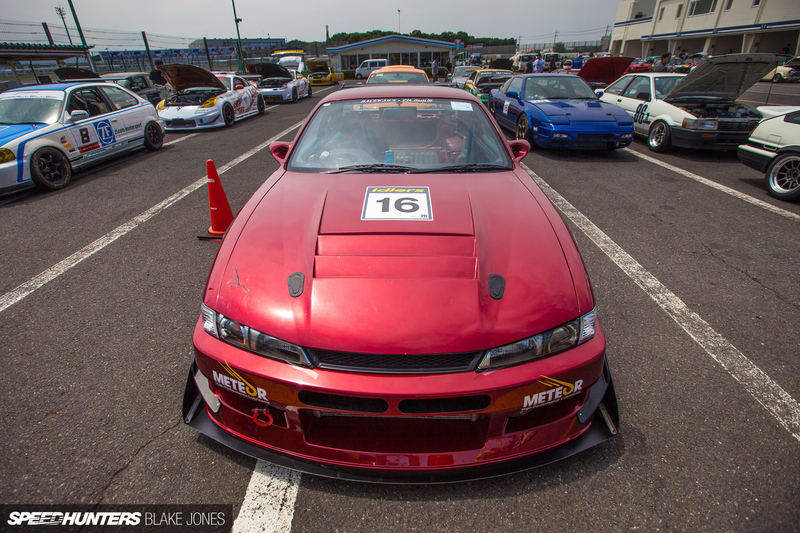 Nice to see a S14 built for something different then drifting. Sure this is guy owned the car for a long time and will not change to another chassis (not in the near future) considering the quality of details, even the engine bay is "arranged and shiny".